This was to be our second visit to France during our gap year. On our first visit we only spent a few days in Paris. I wasn’t all that taken with the city on my first visit, but I had learnt from that and now it was getting a second chance. Last time we had picked a less than perfect location to stay in. This time I had chosen a completely different area – Montparnasse. 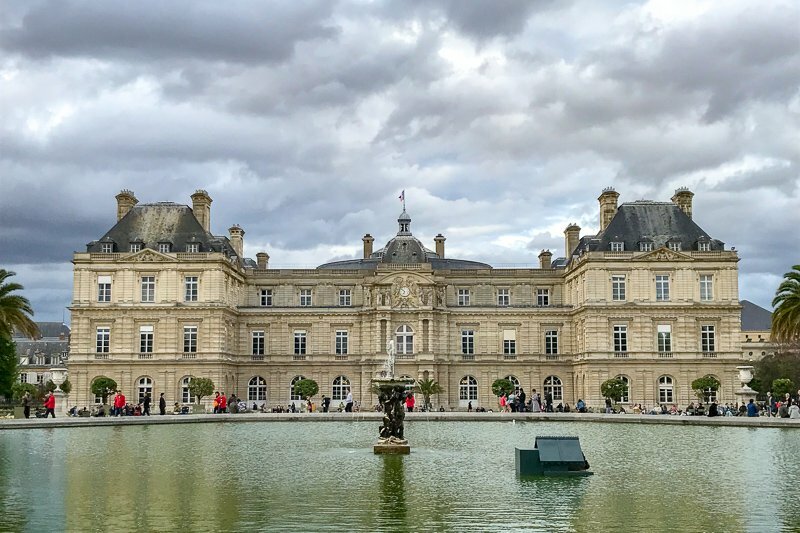 We had booked our accommodation before we booked our flights, as as my luck would have it, we ended up flying into CDG rather than Orly, which was what I had expected for a budget airline and much closer to our accommodation. So we had to figure out the transport from the airport. Easy, you say! And yes, normally it’s a train or two and all is good. But this was France in spring, or, as I’ve heard it described, “strike season”! The trains were on strike intermittently throughout April and May, and we were arriving on a strike day. Through all the confusion, I discovered that the airport trains were still running, but on a reduced schedule. It seemed much cheaper and easier than shuttle bus, since we only needed to change trains once and would end up within a few hundred metres of our hotel. By now in our trip I should have known that if things look easy, they definitely aren’t going to be! The reduced schedule of the train meant that we were like sardines inside. We had all our luggage stacked around us, and literally were pushed back into a corner. There was simply no way to move. At each stop people would literally push their way in and out of the crowd. It was reminiscent of scenes of the Mumbai railway during peak hour. This was the perfect environment for pickpockets, and yes, sure enough, Simon’s wallet went missing! While annoying, this didn’t end up being as much of an issue as it could have been. All year I had been planning for this (okay, so maybe “planning” wasn’t the right word, perhaps “preparing” is better) and had nagged for Simon to keep his cards and cash in to seperate locations. Luckily in this case he had! The wallet that had been stolen only contained cards. We also had a process in place where these cards were all independent of our actual bank accounts. 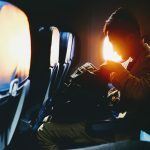 The one debit card he carried was an account set up just for travel purposes and never had any more than a couple of hundred of dollars in it at a time. The credit cards were completely seperate to the ones I carried. So the worst part was the twenty or so minutes we had to spend making phone calls to the banks and cancelling the cards. It cost us a few dollars in Skype calls, but we didn’t lose any cash (although the thieves tried hard!) and we still had alternative ways to get money and pay for things! It was exactly one year to the day since we had left home, but finally my contingency plans were put into action. And finally Simon admitted, yes, pickpockets can still get a wallet out of the front pocket of a pair of jeans! We had arrived late afternoon into CDG anyway, and by the time we dealt with cancelling the cards it was dark and we were tired, so we just decided to quickly grab a McDonalds burger for dinner so we could get some sleep. We placed our order on the screen, but it didn’t like my card, so we had to line up to pay at the counter. Once paid, we were told to go take a seat, they would bring us our order. Okay, that was new to us! Time ticked by, and no food. I went back to the counter a couple of time, but they were still serving numbers before ours. By the time we received our food, almost half an hour had passed. So much for quickly grabbing a burger! Paris was not winning us over! The following morning we had to do the boring travel stuff – wash our clothes, pick up some snacks and finalise the last of our plans. We stuck to the local area, wandering around and enjoying the weak afternoon sunshine until the clouds came in. We were down to only a couple of weeks to go until we were going home, but still we had plenty to look forward to. After almost twelve months of planning, Sunday morning we finally met up with some of our Australian friends. We would be seeing quite a few people we knew over the next week. 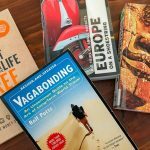 The whole reason we had made our way back to Europe at the end of our gap year was to attend the 2018 Bookcrossing Anniversary Convention in Bordeaux. (read more about Bookcrossing in my post here) There were thirteen of us from Australia and New Zealand attending, and I was really looking forward to seeing these familiar faces – as well as a few others I had met at these international conventions over the years. We first met with one other couple to do a free walking tour with Sandemans. 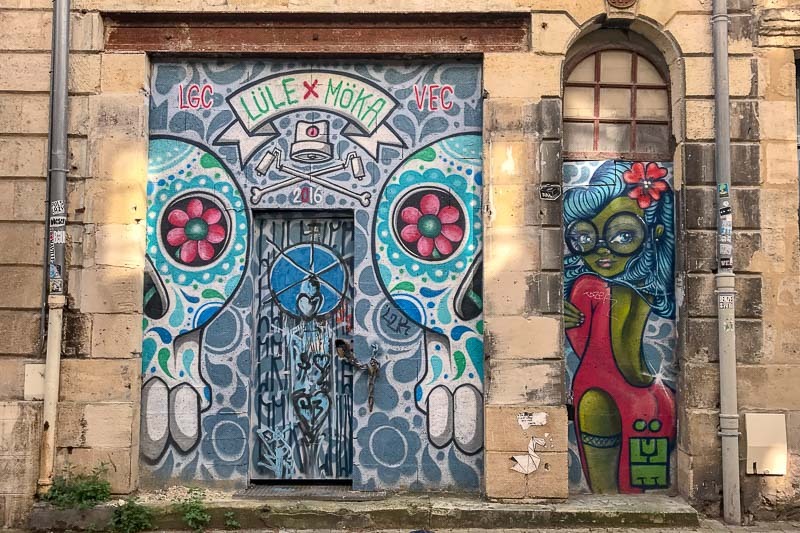 I was introducing my friends to this free walking tour concept that I love so much, and I think they might be convinced to try it themselves in the future. We got to walk around the centre of Paris, starting not too far from Notre Dame and ending up in the Tuileries. In between we heard all sorts of interesting tales mingled with history and local folklore. 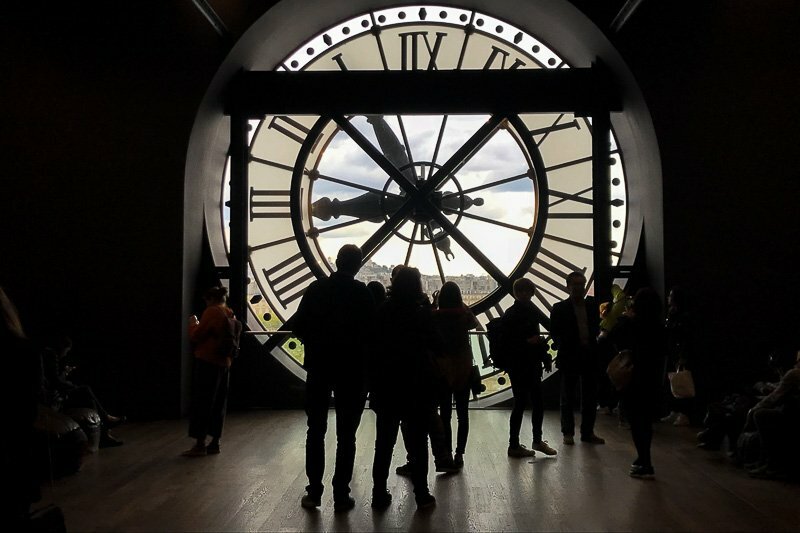 After a quick lunch, we went to visit the Musee d’Orsay. It’s no surprise to those who know me that I am not all that knowledgeable about art. I can hardly pick a Mozart from a Monet! (Joking! I do know Mozart does music, but you get the point!). Art museums are therefore not my first choice. But this one had been recommended to me, and the friends that we were with were keen, so off we went. I actually quite enjoyed our couple of hours of browsing. The building the museum is housed in is lovely, and it’s such a nice space. There were some impressive artworks on the walls too – but the ones I liked may not be what the experts choose as their favourites. 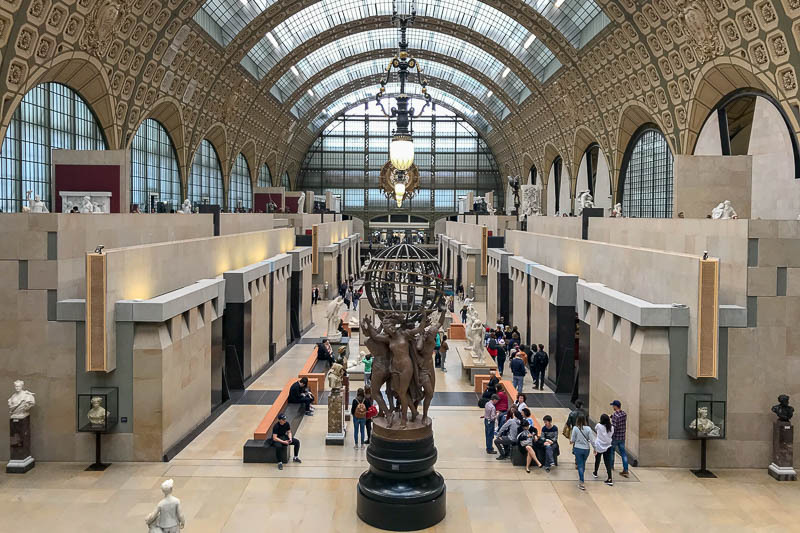 That the Musee d’Orsay used to be a train station is no surprise when the main room is seen. We later met up with the four other people we were road tripping with, enjoying a loud and boozy dinner as only those who hadn’t seen each other for a couple of years can do. 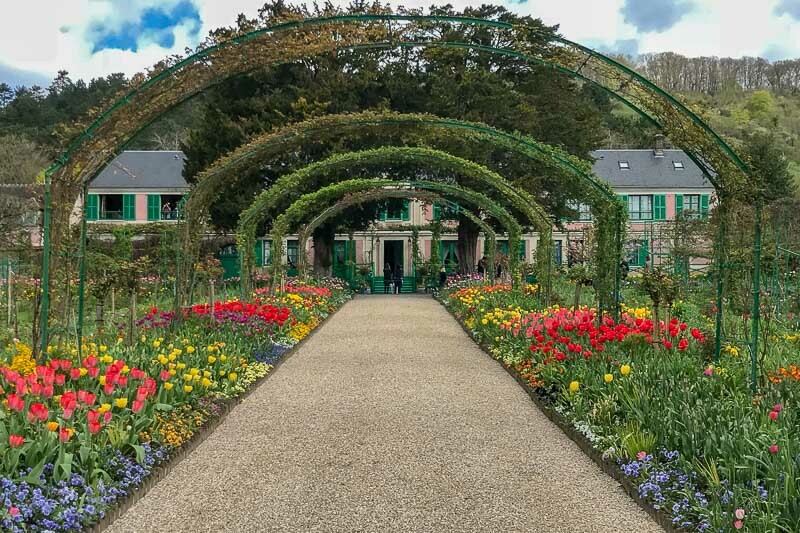 Our road trip started the next morning, and after picking up our cars we were off to our first stop – Monet’s House and Garden in Giverny. The garden here is still much like it was in many of Monet’s paintings. 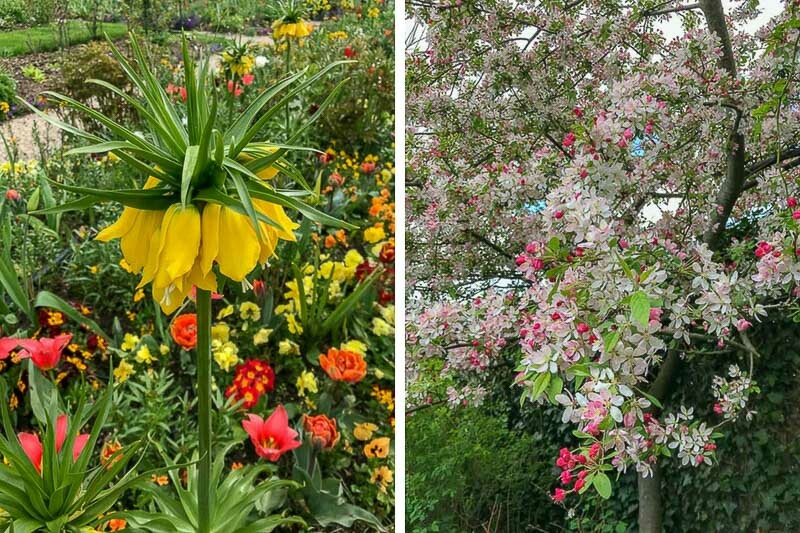 Our visit was in mid April and spring was only just beginning to take hold. 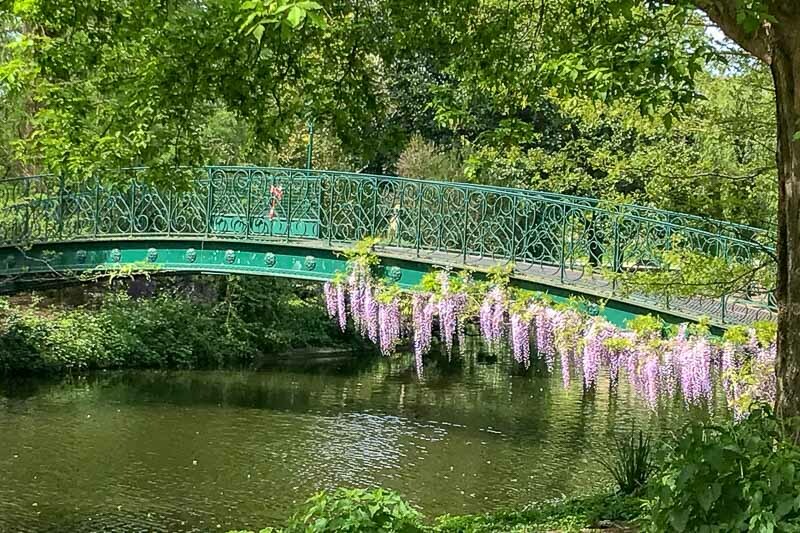 There were quite a few flowers about, but we could tell the gardens weren’t yet in full bloom – the iconic wisteria over the bridge was not yet flowering. 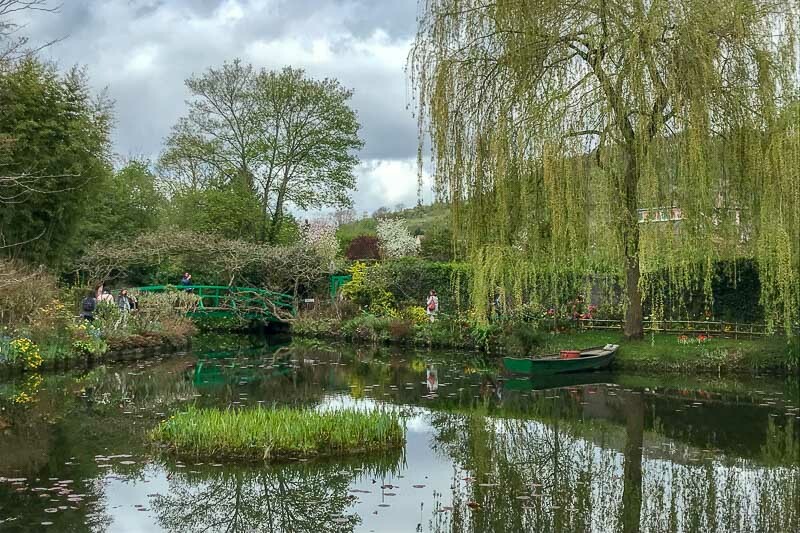 Even so, it was lovely to wander around the garden, then to go into Monet’s house and see some of his artwork and other bits and pieces. We were back on the road again, arriving in time for a very late lunch at our next stop of Bayeux. We were here to see the famed Bayeux tapestry. One member of our crew had it firmly on her bucket list, and the rest of us did not need to have our arms twisted too hard to tag along. 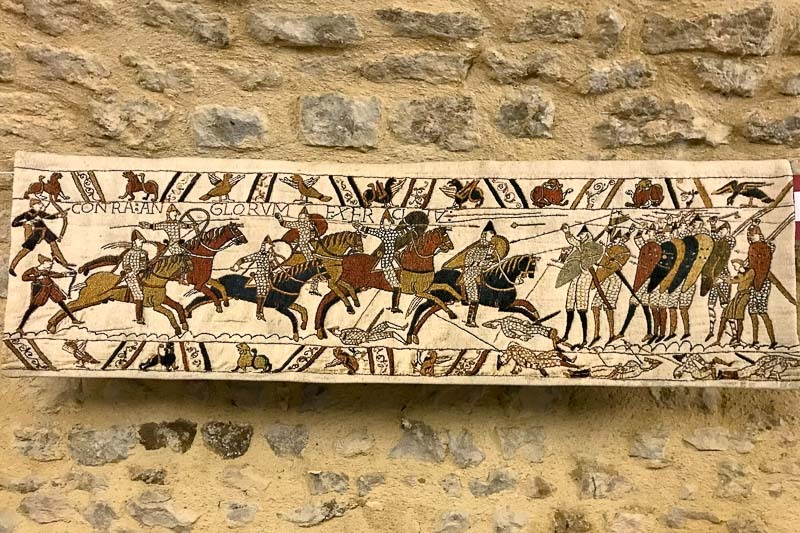 The Bayeux Tapestry is around 70 metres long and tells the story of the Norman conquest of England, when William the Conquerer came to power. It is thought to have been embroidered only a few years after the conquest, so is now over 900 years old. 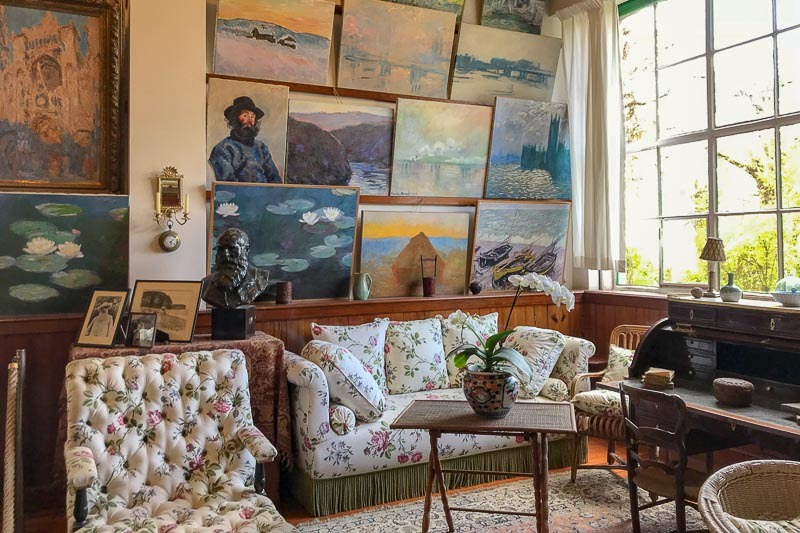 For that it is in remarkably good condition, and to try to keep it that way, it is carefully stored in an airtight cabinet in a dark room to keep the perfect environmental conditions and lighting. I was surprise to see that while the tapestry is 70m long, it is only about 50cm tall. I was expecting it to be much taller. Part of the entry fee is a audio guide, which tells the story of each panel of the tapestry as we walked the length of it. Photos were not allowed, so below is a photo of a reproduced section available for sale in the gift shop. It was late afternoon by the time we finished with the tapestry, but we did have time to have a quick walk around the streets of Bayeux. I could see the spire for the cathedral and just had to go and have a look, and I was not disappointed. 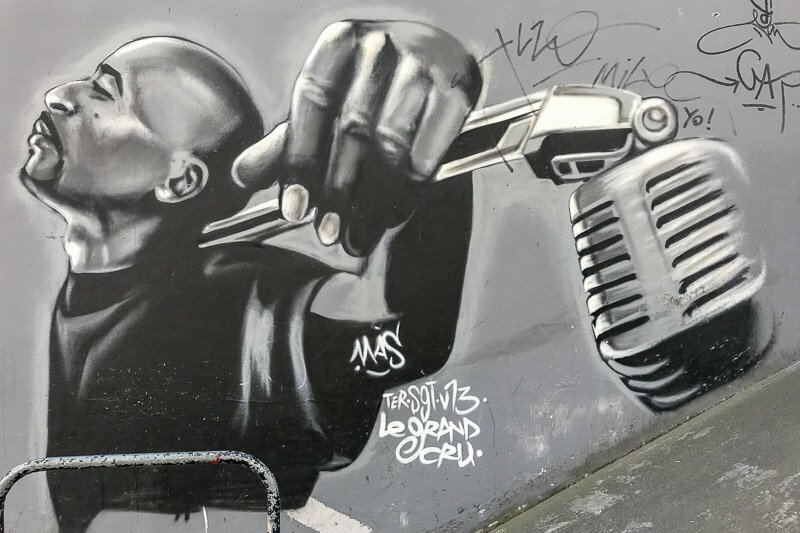 It was one of my favourites in France, and that is really saying something! 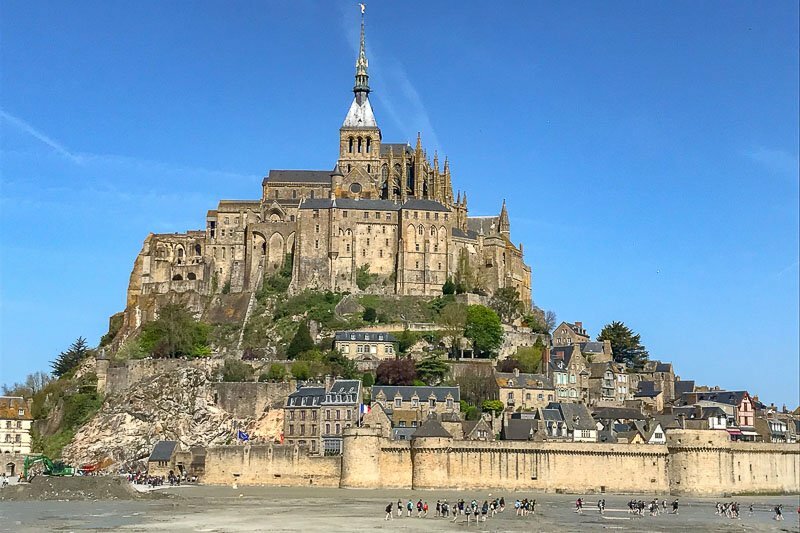 After a night in a fabulous AirBnB, we were off to the place I was most excited to visit on our road trip, Mont St Michel. I have seen so many beautiful photos of this cathedral out on it’s own little island and I couldn’t wait to get there are explore. On arrival we had to park in a dedicated car park quite a way on the mainland. The car park fee though includes a free shuttle bus to and from the island. Once on the island we spent a couple of hours getting lost in the narrow cobbled streets. We had read that eating on the island was expensive, and quality was poor, so we decided to wait until we were again on the mainland to have a late lunch. This was probably lucky as all of the cute little restaurants seemed to be packed to the rafters with visitors. This was the most crowded area, but there were a lot of people visiting Mont St Michel the day we were there. In particular there seemed to be a lot of school groups, which I am guessing was because it was near school holiday time. The sun was out so groups of people were picnicking on the many grassed area throughout the town. Visitors walking across the mudflats at low tide to reach Mont St Michel from the mainland. Many continued to walk out behind the island too. We paid to visit the Mont St Michel Abbey, which is what the whole town is based around. 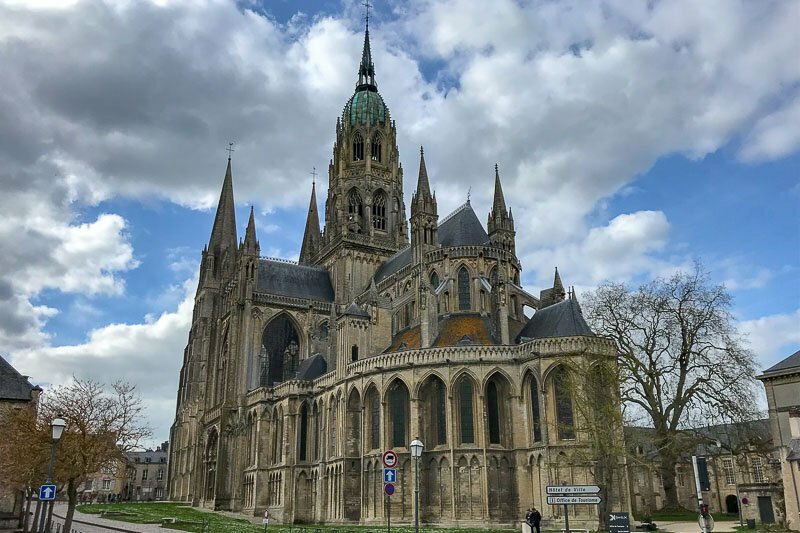 It had nice parts, but the cathedral is not as spectacular as many of the other cathedrals around France. 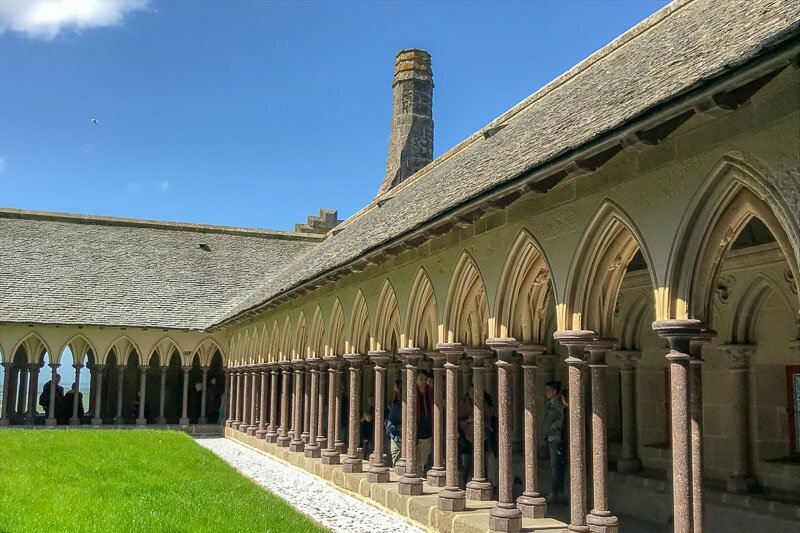 The abbey does have some pretty cloisters, and even prettier views though, and the maze-like path through the whole abbey shows the sheer size of the place. We were fascinated watching groups of people venturing out onto the muddy flats surrounding the island since it was low tide. Some of them seemed to be a long way away, and we knew the tide was turning and it is particularly well known here to rush back in quite quickly. Even though the sun was out, it was not warm enough for a swim! 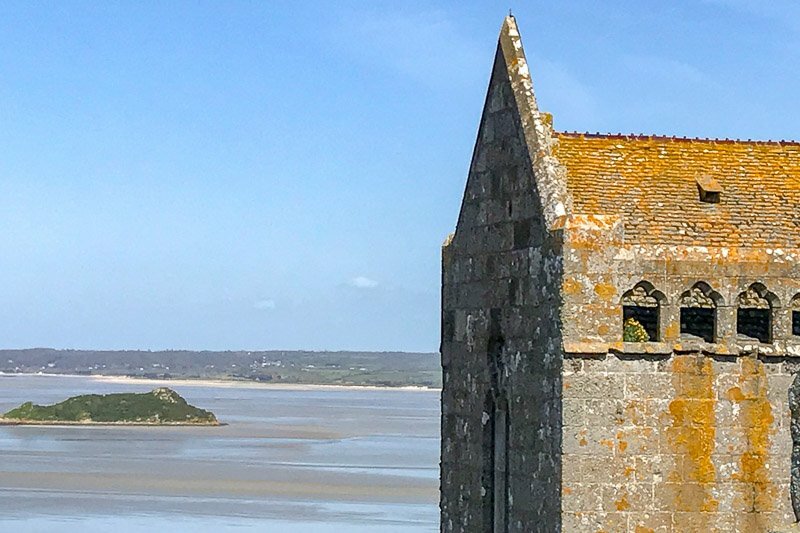 The cloisters of the Mont St Michel Abbey, with stunning views over the sea. The final drive for the day saw us in St Malo for the night. We were immediately taken by this lovely little French town. We had an AirBnB right in the old, walled, town centre, and were challenged navigating there in the car (one-way streets were not our friends this day!) dropping off our luggage, then finding our way out again to park the car outside the walls. 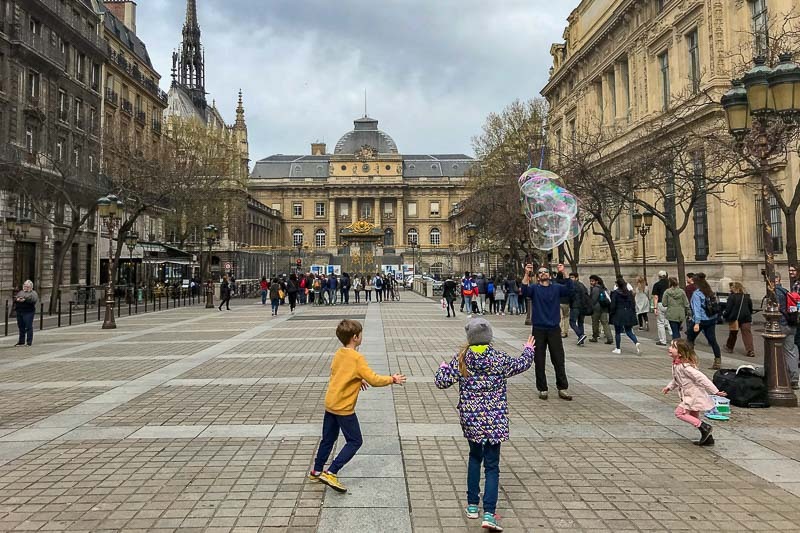 We had planned to buy groceries and make dinner at our AirBnB, but the nice weather, cobbled streets and cute outdoor eateries had us changing our minds. Our evening was spent exploring the area with a few drinks at a bar, before a delicious dinner. It had been another long but enjoyable day, and we had to be up early for another day on the road. 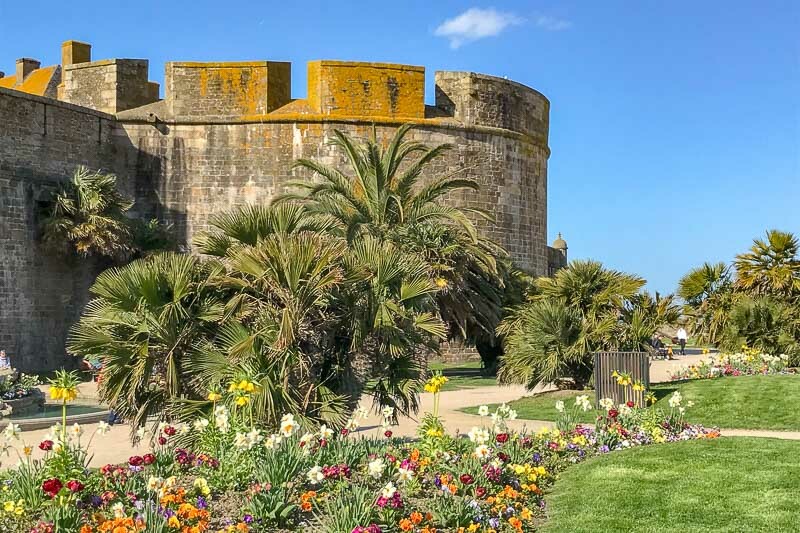 The walls of St Malo old town are still pretty impressive. There was much discussion between our group as to what the annimal is on the St Malo flag. A dog? A dragon? A weasel? Well, the last guess was almost right, it’s an ermine! And this day was the longest, we had about six hours of driving to end up in Bordeaux. The time was taken up with trying to decipher exactly which motorway exits the GPS wanted us to take – then doing a few loops until we got it right. In between that we spent our time visiting local fuel stations trying to figure out if they had diesel or not. The answer was always no, but eventually we realised that in France diesel is also called Gazole (the words are used interchangeably) – which had been available at every fuel station we had already been to. Travel is always teaching us something new! We arrived in Bordeaux to more people we knew. Many of the people attending the convention were staying in the same accommodation as us, and many were arriving the same afternoon. The next few hours were spent catching us and having a good laugh. The festivities went on into the evening, but I escaped to get some rest. I could again feel a slight cold coming on, and I thought an evening off might help me to combat it before it got bad. 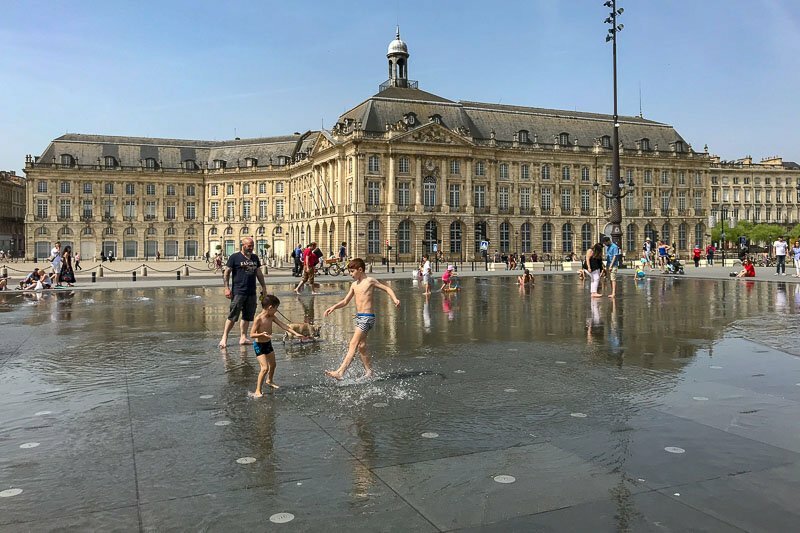 The Bordeaux riverfront has an area that fills up with an inch or two of water. The kids love to play in it to cool down on hot days. The following day we had a pre-convention tour. 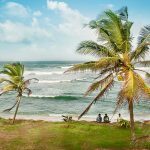 These international conventions, by their very nature, have visitors from all over the world so the organisers will often put on a day tour or two either side of the official proceedings so visitors can see some of the local area. 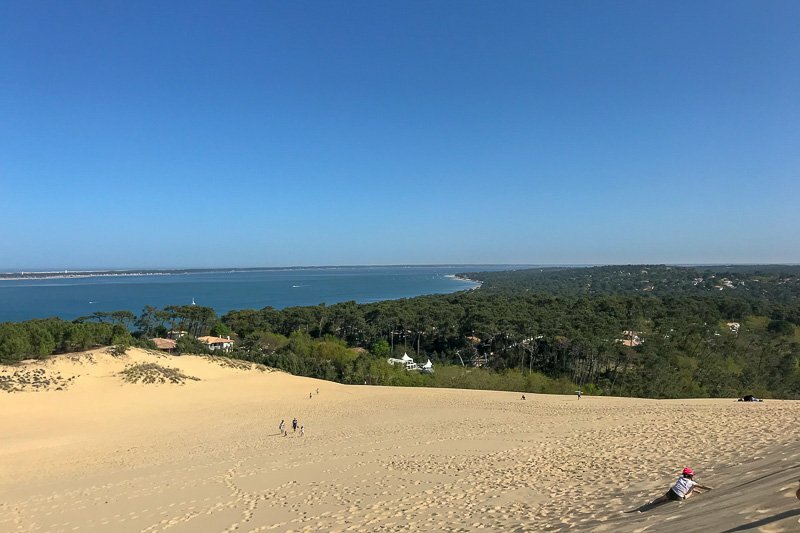 Our first stop was the Dune du Pilat, the tallest sand dune in Europe. 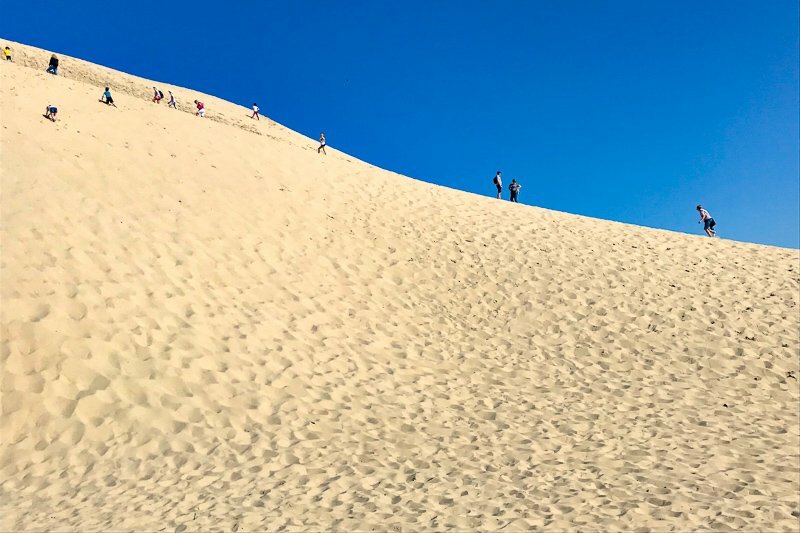 Unfortunately do to traffic, we had limited time here, but we did get to climb to the top of the dune to check out the view out across the ocean. We were back on the road again to the opposite side of Bordeaux to St Emilion. 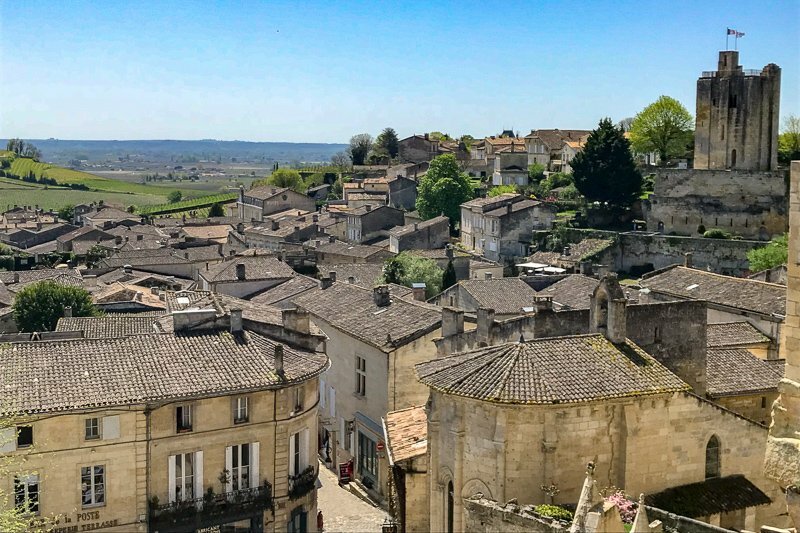 We were mostly here to do some wine tasting, but during our visit we also got a short tour of the town with a local guide to learn about the history of this UNESCO site and see the Monolithic Church of Saint-Emilion. This church was cut into the rock so half of it is below ground, with a towering belltower rising well above it. The history is interesting, but the church is slowly disintegrating, with huge supports in place inside now to ensure the belltower stay standing for the foreseeable future. Then it was on to the wine tasting. 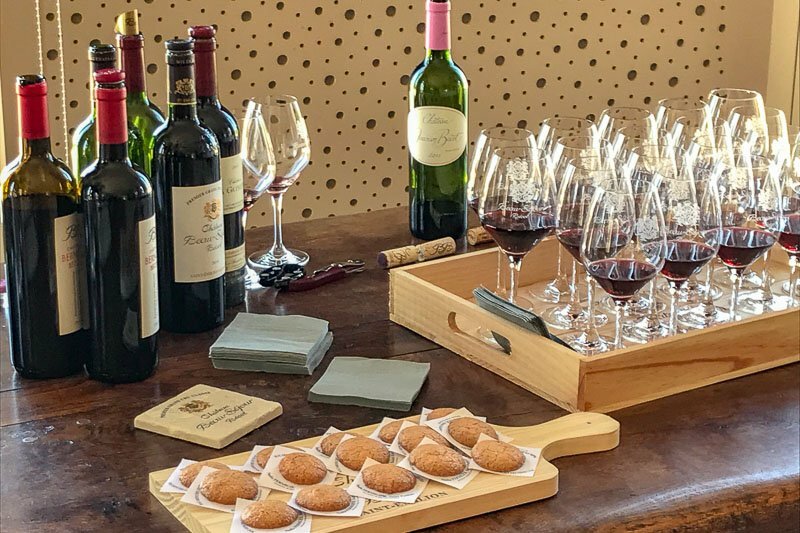 We visited the Château Beau-Séjour Bécot winery, learning about this boutique, family run business and touring their cellars. 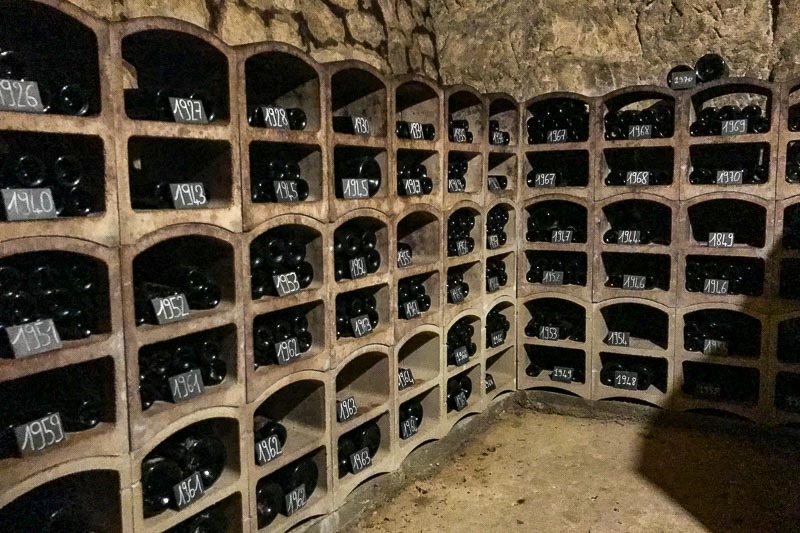 We could see wines from over half a century waiting for the perfect moment to be opened. We got to taste some more recent wines that were all made in the traditional Bordeaux style of the region. I had to say though, that for the price, I was disappointed in the wines. On mentioning this to the other Australians, we all had similar views, but many of the European visitors were impressed. 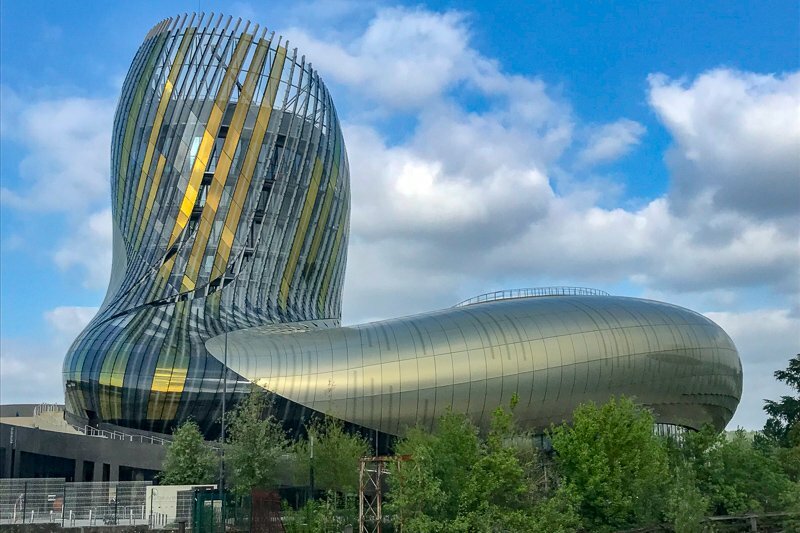 Bordeaux wines are well acclaimed – and this winery is no exception – so I came to the conclusion that the Aussies in the group are so used to the taste of our own wines, and these ones were not “bad”, just “different” to our palates. Friday afternoon the convention officially started, which meant even more people finally arrived and we drank more wine, chatting, catching up and meeting new people. Saturday was when the most serious stuff at the convention occurred. During the day we had some local authors telling us about their books, how they write and answering all sorts of weird questions our group came up with. In the late afternoon came the part I had been more looking forward to and dreading, all at the same time. I had been putting together a bid to hold the international convention on the Gold Coast in Australia in 2020, and it was time for me to present the bid to all the convention attendees. 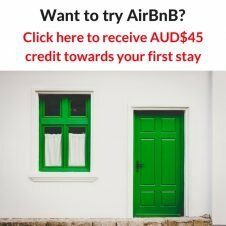 I had created a Powerpoint presentation, and had a promotional video showing off the Gold Coast ready to go. I discovered on Friday that there was not going to be a screen or any way to show these things. Okay, I was just going to have to wing it! It apparently went across really well, and our bid was successful, so I now have two years to plan a convention on the Gold Coast. I have so many ideas though, so long as I can work out the venue, it should all fall into place. There is a great group of people here that will be helping to do this, and I am excited for the challenge to come. 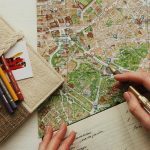 Half of the challenge will be helping people to turn this into the holiday of a lifetime, so this will cross over with my blog as I test out experiences and research accomodation, transport and restaurants. After the presentation we went out for dinner – and the crazy Aussies all ended up making too much noise and being the life of the party. We ended up in a pub, with a whole bunch of Irish people, (in town for a rugby game, nothing to do with Bookcrossing) singing ballads and football songs. Not what I was expecting to do in France, but a great night out and so much fun. The convention officially wrapped up on Sunday with us scattering Bordeaux with books and doing a flash mob outside the Cathedral. We were then free to do more of what we seemed to be doing best this weekend – drink wine! Bordeaux was being a bad influence on us! Some people were leaving Bordeaux on their way back to work or on to further adventures. Those of us left grabbed wine, cheese, bread, whatever we had, and went to the park for a picnic. Ironically we now saw wisteria flowering on a green bridge, almost like we expected to see in Monet’s Garden. 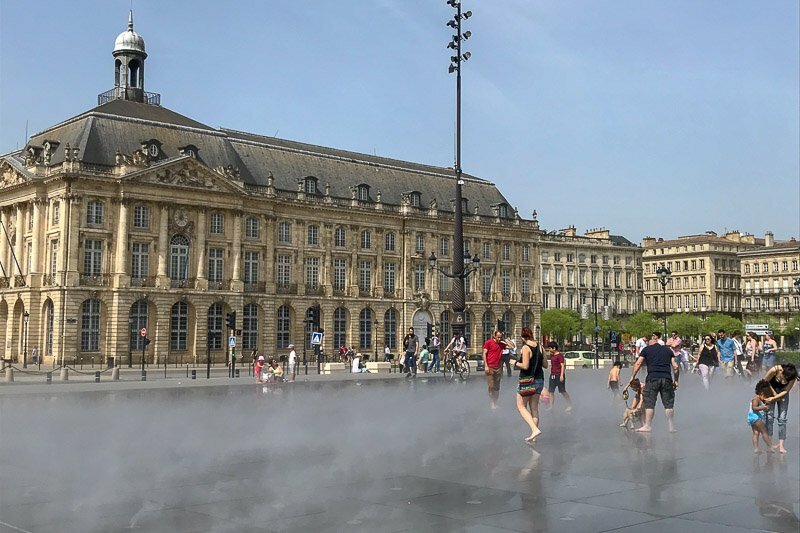 When we arrived in Bordeaux we were not sure when we would be leaving. We just knew we had to be in Paris on Wednesday night in time for our flight out on Thursday morning. I had been tossing up between staying in Bordeaux or exploring another town on the way back in Paris. Once we discovered we needed our International Driver’s Permit in France, another road trip was ruled out as ours had just expired, so we were limited to public transport. As mentioned before the trains were periodically striking, now Air France had joined in too, and buses were going to take all day to travel from Bordeaux to Paris! Monday and Tuesday were strike days, so after tossing up every option, we decided to book train tickets for the Wednesday straight back to Paris and hope it all worked out as we weren’t leaving much room for error. The extra two days in Bordeaux meant we had to change accommodation since where we were staying was booked out. So that was our Monday morning job, before meeting more friends to catch the ferry to Bordeaux’s most popular attraction, Cité du Vin. This distinctive building houses a wine museum. I was excited to come here, but I was wondering in the back on my mind what they could have in a museum. Here there is information about wine regions around the world, information about grapes, climate and the growing process, the history of wine in Bordeaux and France, interactive displays about colour, taste and smell of wine, a wine library and study centre, a wine shop, and last but definitely not least, a tasting room. There is easily enough here to keep visitors interested for two or three hours before the tasting, which is on the top floor with 360 degree views over the city and river. 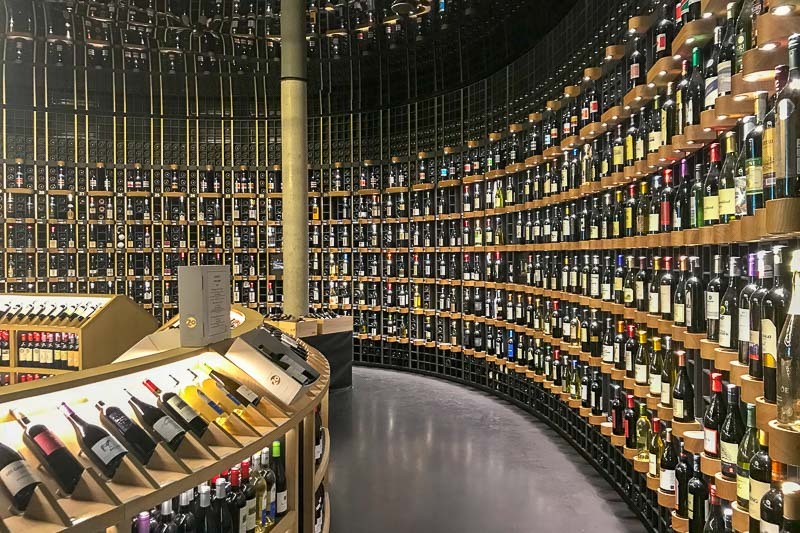 The wine shop in Cité du Vin has wine from all over the world, including many countries I would not associate with wine. Our final day in Bordeaux started with a sleep in and lazy morning. That beginning-of-a-cold I had was still hanging around, but luckily hadn’t turned into the real thing. 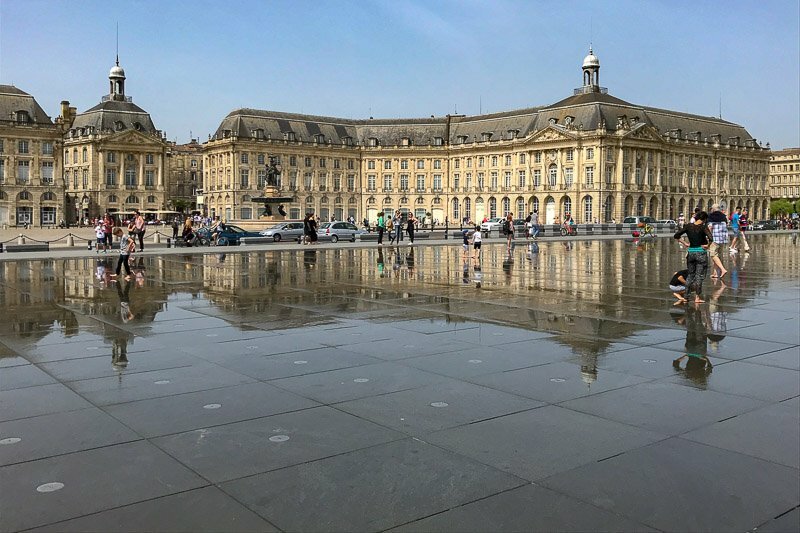 The afternoon was a gentle stroll along the Bordeaux riverfront, enjoying the atmosphere and the sunshine. We had been eating out with friends every night, so took this chance to rest before one last meal out on our final evening. The train trip to Paris the following day was on one of the fast trains. We were travelling at around 300km/hr, so did the 600km trip in around two hours. 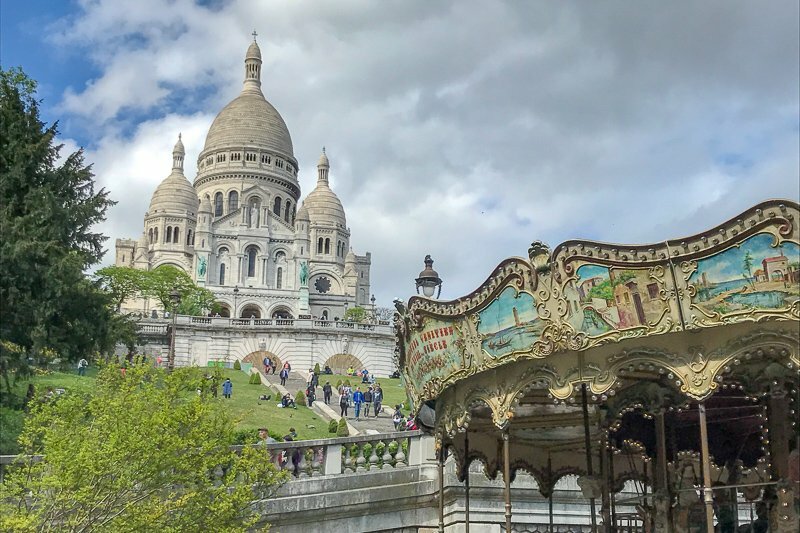 We had yet again managed to book accommodation on the “wrong” side of the city – our train arrived into the Montparnasse train station, walking distance to our accommodation a week earlier, but this time we were staying in Montmartre. 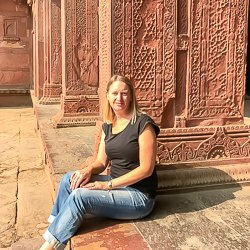 We arrived at our accommodation, a basic, comfortable hotel which was a little worn around the edges but fantastic value, settled in, then headed out to explore the area. 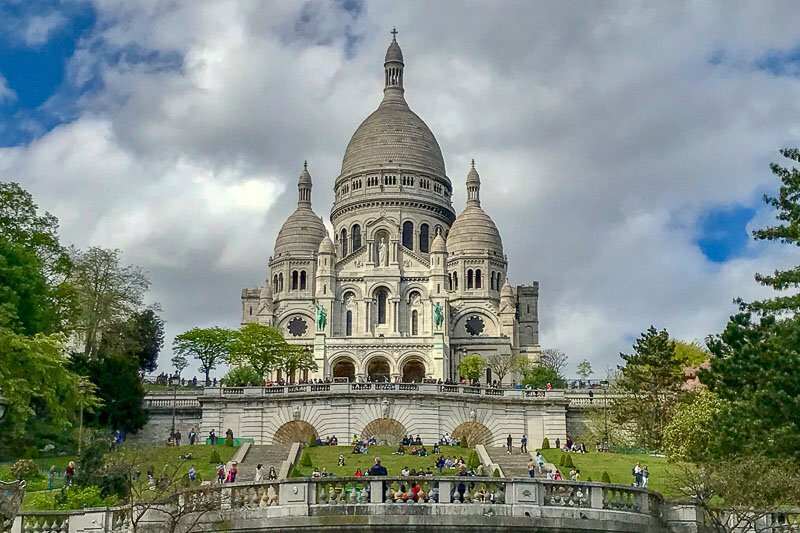 We had briefly visited here on our first trip to Paris to see the Moulin Rouge and Sacre Coeur, but this time we wandered more slowly up and down the streets. We went up to Sacre Coeur again. It really is a spectacular building, both inside and out. One day I will be in Paris and there will be beautiful blue skies and I will climb the dome to get fantastic views. The next morning we said goodbye to Paris, goodbye to France and goodbye to Europe as we made our way to CDG airport, for the first leg of our flight home and the end of our gap year. 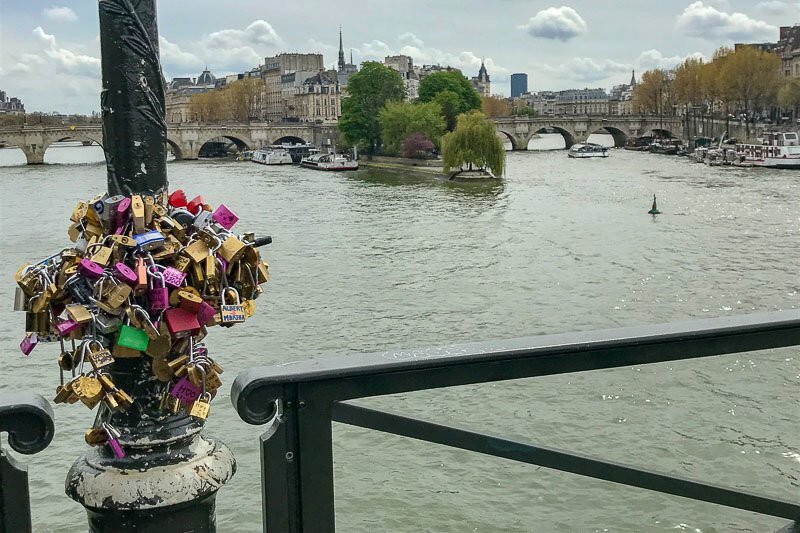 I’m still not in love with Paris. In fact, I barely like it. I will probably be back at some stage, but it will always be a stopover location rather than my destination. It’s just not the city for me. I liked the French countryside much more though, and this will be what I come back to France to see in the future. 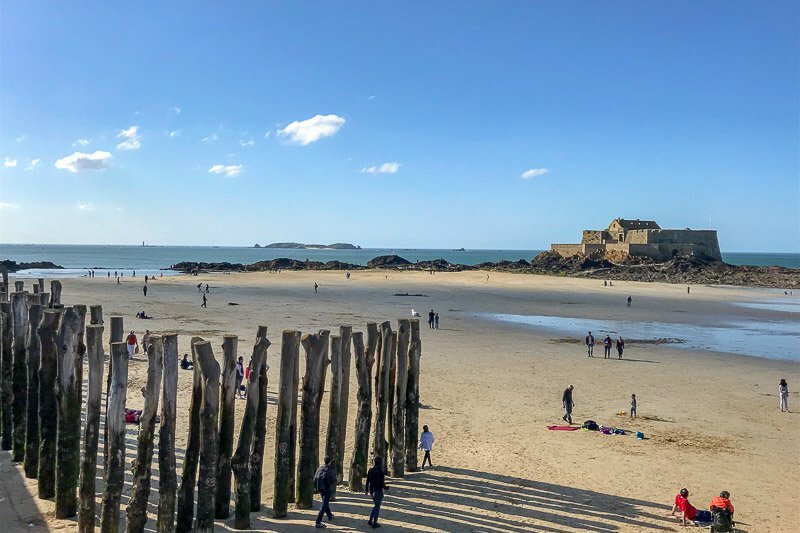 St Malo was just lovely, and I definitely would like to visit again for a day or two rather than a brief overnight stop. I find the Paris Metro to be one of the better public transport systems. No matter where you are in the city there seems to be a station nearby. I use Google Maps, put in where I am and where I want to go to and it gives me the exact trains and stations. The trams and ferries in Bordeaux were good too. I suggest buying a transport pass to cover your stay then you can hop on and off at leisure during your stay. I had a European SIM card while in France so was not relying on wifi, and as such didn’t notice it as much. It was regularly available at tourist locations, and the speed at all our accommodations was decent. Overall, prices in France are on the higher end of the scale. Not as expensive as London, but still in the same ballpark. Bordeaux was a little cheaper, especially for accommodation. 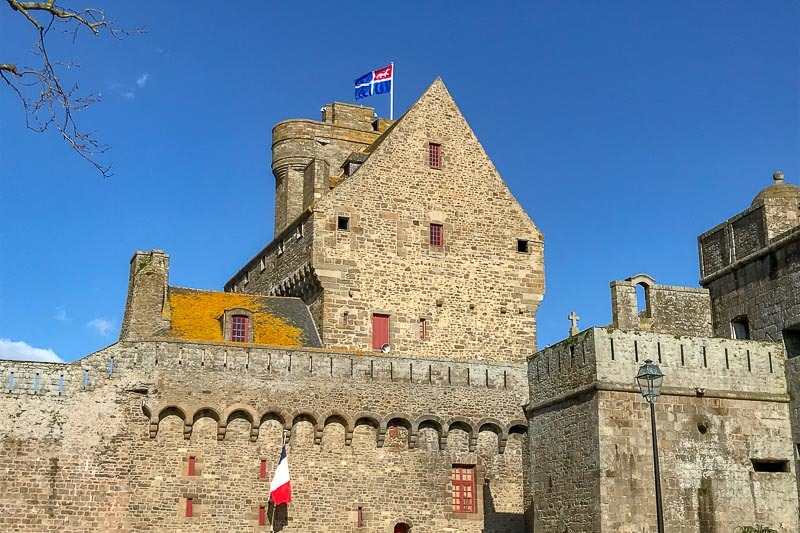 This was my third time doing a St Malo – Mont St Michel – Bayeux trip. 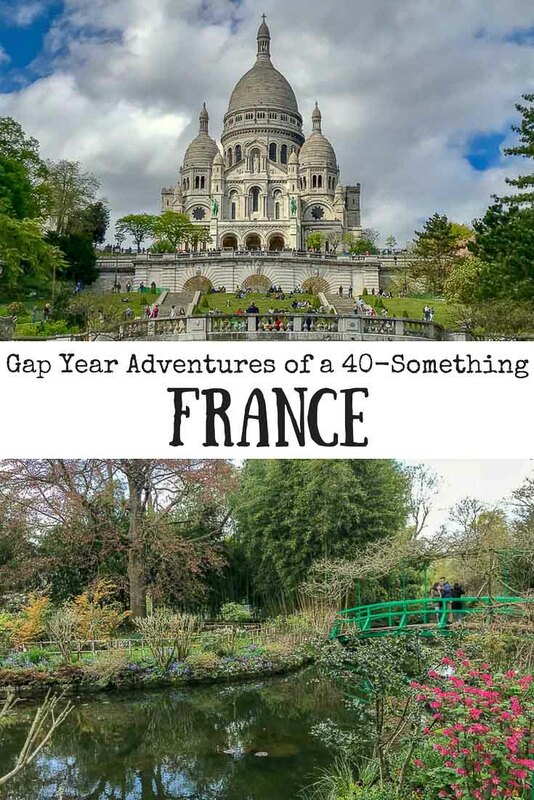 The setting in France, with farms and bistros and chateaux and villages at every turn is remarkable enough, but to see three amazing pieces of history in as many days is the gold on the icing of the gateaux. St Malo was just a place to catch the ferry on my first trip. But I dropped off the car and there were a few hours before the ferry left and there was a walled city just a few hundred metres away. Exploring it was one of the best travel experiences of my life, and I vowed to return. I’m still not done. I want to come back again, look out over the view, explore some more of the narrow streets, enjoy some more restaurants full of fine food and atmosphere. And, trust me on this, but walking out on the sands at low tide is an adventure. There are little island forts to look into, rock pools and rivulets, the thrill of allowing enough time to get back safely, and you look up to see that fantasy walled city ahead. We did all that, and found the fog rolling in. The view disappeared, the landmarks vanished, and the tide was at our heels! It was a surreal experience, to be sure. I have yet to write up my stories of this latest trip. 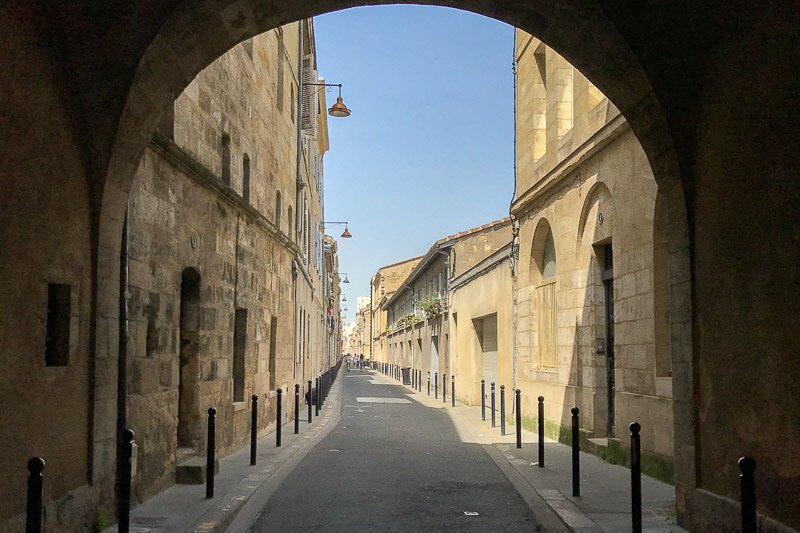 You have experienced so many wonders – and wanders – but for me the week in France was a travel highlight. I enjoyed almost every moment. Battling with the GPS, trying to refuel, and the struggle of the car return, not so much! Wow good luck trying to organize the Gold Coast Convention from down here. I gave so many books away when we sold our house in Currumbin .. and still have boxes of books in our storage shed in Burleigh Heads .. most probably ruined by now. I think you are very brave. What a great post. Yes, I think we get so caught up in the Paris lights that we forget how beautiful the rest of france is! I personally love Normandy, though I need to do much more exploring! Totally agree! I hardly hear anything about France outside of Paris. Thanks Erin. Yes, all the things we have go wrong seem to be when I am feeling the most confident that nothing will go wrong lol. I continue to think that one day everything will actually go right! We’re just lucky othing REALLY bad has ever occured, mostly things that are just annoying! While I love Paris, it is not my favourite city in Rome and I agree with you that I prefer the countryside. Mont St Michel is simply stunning! Yes, I was so excited when our travelling companioins suggested Mont St Michel, because I had wanted to go there for years.